Channel two (s/AGC) of the scope can be used in conjunction with thunder to easily approximate the distance of a lightning strike. 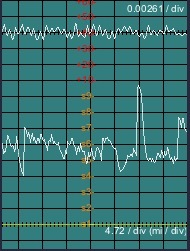 To measure strikes, tune to an unused frequency, as shown at the right. Nearby lightning will show as sharp signal level spikes on the s trace. Thunder is delayed by atmospheric propagation of sound for approximately 3 seconds per kilometer. What we want to do is adjust the grid spacing to one kilometer (or one mile, as you prefer) per division, and align the grid to the right side of the scope so that the moment the lightning waveform appears, it is aligned with the grid's vertical axis. To make this all work, you change the scope grid alignment and spacing to precisely measure miles or kilometers by right-clicking on SCP. One setting is 4.72 seconds/Div, which is the amount of time thunder takes to travel a mile. Another setting is 2.94 seconds/Div, which is the amount of time thunder takes to travel 1 km. In the example image to the left, I captured the scope when I heard the thunder from the most recent strike — that's the moment you determine its distance. As you can see, the strike itself had moved almost three divisions in from the right edge at the time, so this strike was well over two kilometers away. If you prefer your estimate in miles, as shown on the right, simply right-click on SCP and the grid spacing will adjust accordingly. To change back to the normal spacing, right-click SCP again. The three settings change in sequence, so if you go too far, just keep clicking and you'll get to the desired grid spacing. 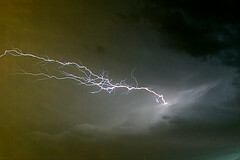 The right hand image was also captured when I heard the thunder, so that strike was just about exactly two miles away. Note: By default, each horizontal division is about 3.12 seconds (or 6.24 if RAT is on.) 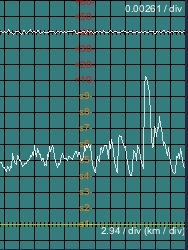 Also, the grids are aligned to the left (trailing) edge of the waveform. Because of these two factors, the scope's default settings aren't very effective for lightning distance estimation.